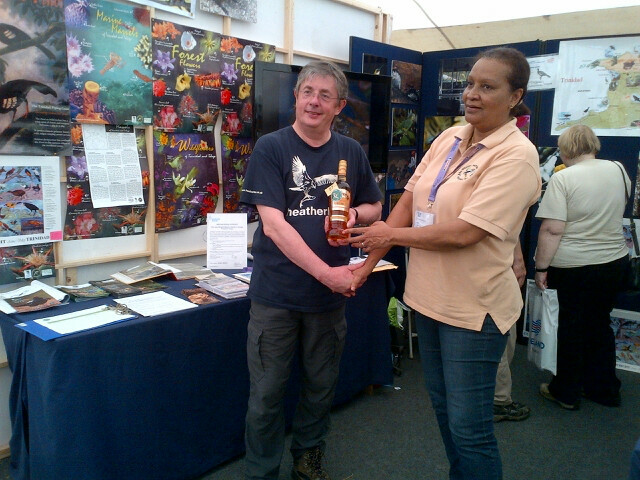 CEO Veronica Simon-Wallace presents a bottle of Angostura Single Barrel Rum to a lucky patron at the Asa Wright Exhibit. 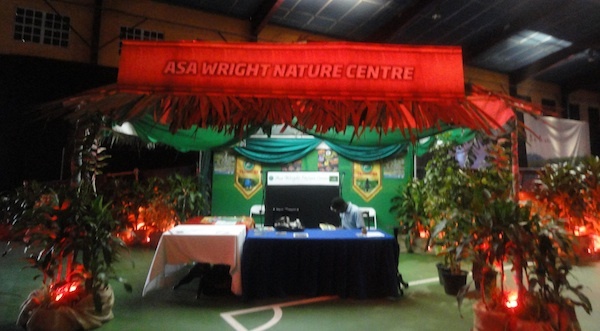 Asa Wright Nature Centre spent a month of outreach during August, exhibiting our wonders at the UK Bird Fair in Rutland, England, and at the local Tourism Fair “Tour & Explore.” We also conducted a series of in- house safari camps for schoolchildren. The UK Bird Fair is one of the most important annual Bird and Nature Exhibits, and Asa is now a regular exhibitor at this gathering, which was held from August 17th through 19th. We were represented by former Lodge Manager Ann Sealy, who knows quite well what is expected of us there, and by CEO Veronica Simon-Wallace. We presented the gorgeous, natural wonders of Trinidad and Tobago, and particularly Asa Wright’s Spring Hill Estate, to the interested Birders who come from all over Europe. We are sure they would have been enticed to stay with us to experience our verandah, forests, streams and bird life. We are anticipating seeing some of our regulars, and now, new visitors over the coming months. externally for special sights and activities, without realizing the wonders existing in our own islands. “Tour and Explore” consisted of presentations of our Northern range forests, our wetlands and turtle-nesting beaches, among other natural wonders of Trinidad & Tobago. Our booth was set in the specially designed Northern Range, and we attracted a constant flow of visitors, many of whom had not known of Asa Wright.